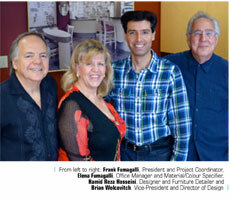 Modular Design Systems Inc. (MDS) is an overnight success, 25 years in the making. Owned and operated by Frank Fumagalli and Brian Wolcovitch, MDS has impressed and influenced the optical industry since its inception in 1989. What started out as a chance meeting in 1998 between Fumagalli, a general contractor and Wolcovitch, a frame sales rep and office space planner, turned into an amazing collaboration, for each man had one of two essential skill sets required for designing and building world class offices. The two met when Fumagalli, a contractor with a background in architecture and furniture design, was building an office that Wolcovitch had designed. As they got to know each other and worked together, they became friends. Wolcovitch told Fumagalli about a new display concept he envisioned, which was a variation of the acrylic frame rod he introduced to the optical industry in 1976. Wolcovitch wanted to make the new display totally flexible, but he wasn’t sure how to go about it. Fumagalli came to him a week later with a full set of blueprints, resolving the flexibility issues. Together, they developed and patented the display system. As it turns out, Fumagalli was training to be an architectural technician in his home country of Argentina. Typical of foreigners entering a new country, Canada didn’t recognize his credentials and like so many others before him, Fumagalli had to find a way to make a living. He learned everything there was to know about the building industry and at the time of their meeting, was one of the best general contractors Wolcovitch had ever worked with. Wolcovitch taught his new partner everything there is to know about designing an optometric office and Fumagalli in turn, taught Wolcovitch every aspect of building an office and designing furniture. Consequently, both men bring considerable know-how to bear on every office they design. Elena Fumagalli, Frank’s wife, makes two essential contributions to the company: she runs the office, and also creates the gorgeous colour schemes that complete every office designed by MDS. Wolcovitch knows the optical business thoroughly and is very clear about the complex web of needs, all of which must be met in the well-designed office. “Aesthetics are a critical element because when people love an environment, they enjoy spending time in it and they purchase better product, much more often. But just as important to our clients is the flow aspect of the design,” he says. A wide variety of holders are available for the MDS frame display system, from single acrylic frames holders to trays of frames, allowing you to display as many or as few frames as you want. Holders can easily be repositioned at any time, so there won’t be gaping holes in the display after sales have been made, or empty holders can be removed and stored until new product comes in. Stock rotation is simple and convenient, and the whole board can be redesigned quickly for fresh impact. Not long ago, a client told Wolcovitch that in the first month after their newly renovated office re-opened, they experienced the strongest month of sales in their 25-year history and that month was January, traditionally the slowest month of the whole year. Also recently, MDS had a group of doctors tell them they wanted to double the size of the dispensary in their new office design, citing the fact that frame sales represented 60 per cent of their revenues. You can see many examples of MDS magic at www.modular-design.com.